Pictures and photos of El Paso's Mission Trail, an historic grouping of three Spanish Missions dating to the Pueblo Revolt in Taos, New Mexico in 1680. Members of the Tigua Tribe migrated south along the Rio Grande River to escape the conditions up north. Ysleta's mission was formed at that time to minister to the Tigua people who continue as active members to this day. 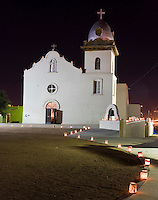 Socorro Mission is next in line to the east, and San Elizario Mission was the original county seat of El Paso County, Texas before the city of El Paso grew larger with the coming of the railroads through El Paso del Norte.